We wrote a story about BrandYourself a few weeks ago and thought that our readers would want to know more about the feature that lets you see who is Googling you. We have invited Alex Levin, Head of Partnerships at BrandYourself, to give us some more information. As you mentioned, BrandYourself lets you control what people find when they Google you. And when someone finds your BrandYourself profile, we not only tell you how they found you and where they are located; now we can literally tell you where they work. We realized users really wanted a better understanding of who’s actually looking for them online. The average person isn’t getting a ton of traffic so somebody who finds them is usually important. So similar to how LinkedIn and MyLife let you see who is looking for you (but only among internal users), BrandYourself now lets you see who is looking for you, regardless who they are. For example, imagine Jim, an advertising account manager, is interviewing at agencies in NYC. 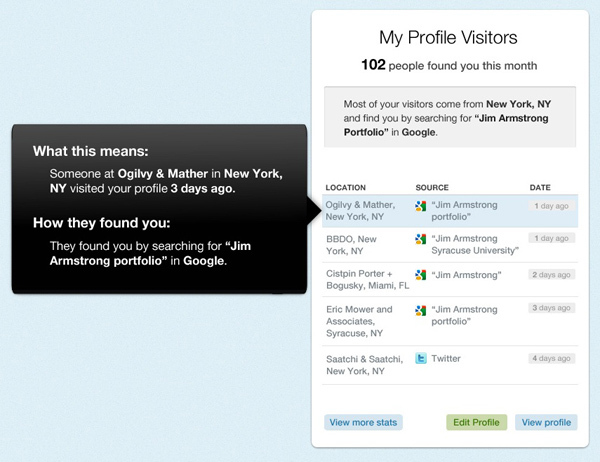 We can alert Jim and let him know that somebody from Ogilvly just Googled “Jim Armstrong, portfolio” and found his profile. Great information to have, and a good reminder to keep an eye on your BrandYourself account to make sure employers (or others) find the appropriate information about you when they look for you online. We are able to give our users this incredible feature based on some great work by our team. We have access to some databases that match IP addresses to major organizations and their various locations (universities, fortune 1000 companies, non-profits, etc). Whenever organizations register for Internet access, they are assigned these IP addresses and they are recorded (don’t worry, the databases don’t contain individuals names mapped to IP addresses). So when someone finds you, we use their IP address to look them up. The ability to see who is Googling you us just one more thing BrandYourself is doing to give you more control over your brand or reputation online. 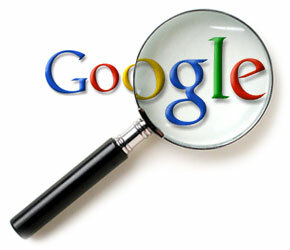 You can register for free to boost positive Google results and bury unwanted or negative results. If you want to change more than three links, it’s only $10/month. * Disclosure: Facecrooks has an affiliate relationship with Brand Yourself.